Pottery has long given us a glimpse into the past - we learn about ancient civilizations from the diggings of numerous archeologists around the world. This book however, according to the Introduction, "...mostly shows non-utilitarian pieces from the post-1888 era - small, non-functional, sometimes European-influenced shapes, and modernized designs." Whether you've appreciated pottery at shows, in museums, or antique shops, there are many wonderful designs you can enjoy on these pages, and the ones featured in this book were all acquired by the authors between 1992 and 1995 from the Arizona and New Mexico area. They give great advice if you collect pottery or plan to start collecting, and how you can avoid the mistakes they made. It's part reference and part guide to learning about pottery. They cover Prehistoric Pottery (Mogollan, Anasazi, Salado, and Casa Grandes among others), Modern Pottery (Acoma, Cochiti, Hopi, Nambé, Santa Ana, Taos and Picuris, and Zia among others), and Collections. 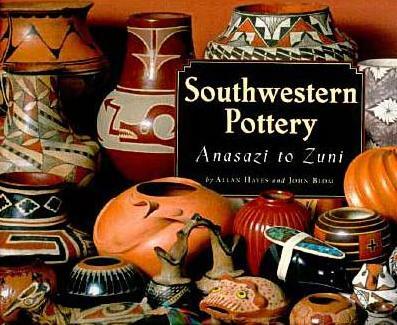 I loved the Zuni pottery on page 171, the Navajo on page 101, and Acoma on page 49. Conclusion - A great introduction to the particular kinds of pottery from these areas and full of wonderful ideas for collectors.